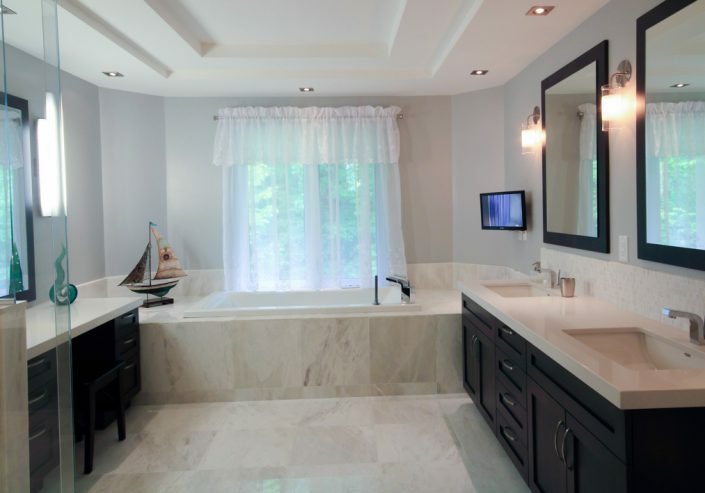 Be inspired by this magnificent luxury bathroom renovation project in a residence on Montreal’s South Shore. You too can benefit from our expertise as a general contractor specializing in bathroom renovations and our turnkey renovation services. Call us for a free consultation! A bathroom is one of the places you visit most often in the same day. It is therefore essential that it be a harmonious, stylish, and practical place, with a touch of luxury. 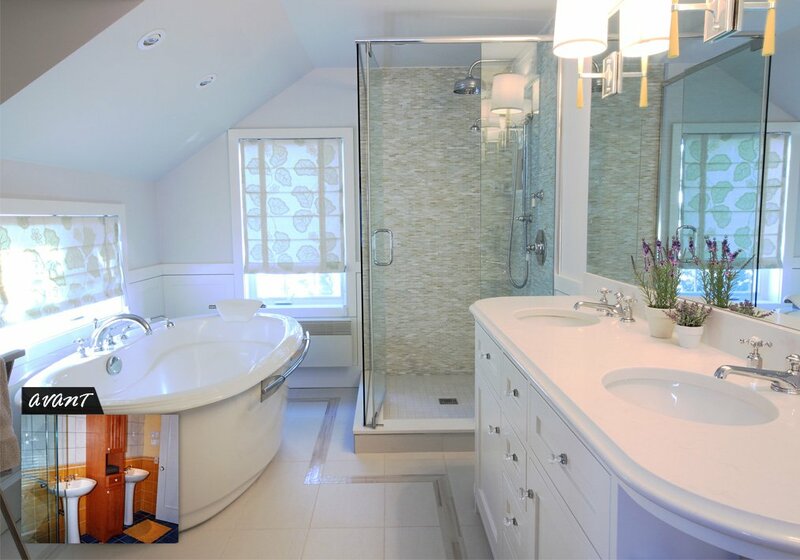 These clients on Montreal had a luxury bathroom renovation project in mind for quite some time. 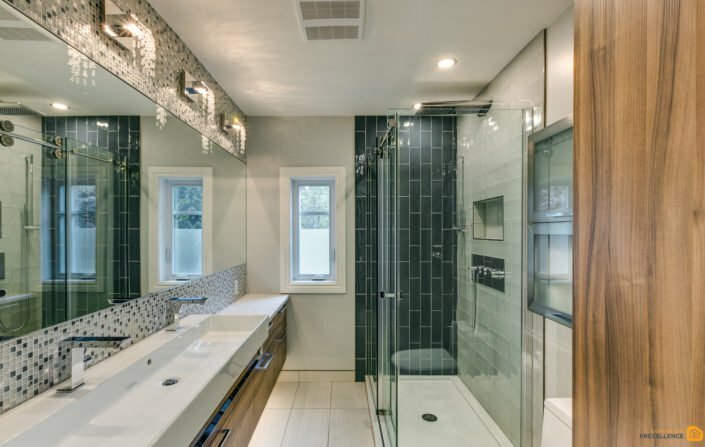 With the help of our design team and architectural technicians, we designed a new configuration to maximize the space of this new dream bathroom. Before starting the renovation, our team carried out extensive demolition work. We removed and placed the wooden cabinets, sinks, floor, recessed shower, recessed bathtub, ceramic tiles on the walls. We have done extensive wall plastering and plumbing work to accommodate the new facilities, including the new bathtub and shower. For the floor, our customers have chosen a ceramic tile floor covering with mosaic ceramic mosaic insert in earth colours. They also opted for a double bathroom vanity, custom-made with melamine drawers and cabinets and a porcelain countertop. The vanity also has two sinks with antique style stainless steel fittings. For the shower, our customers were tempted by a shower with raised shower tray and glass doors. The two walls are made of mosaic type ceramic. There is also a telephone shower as well as a rain shower head and a ceramic floor. 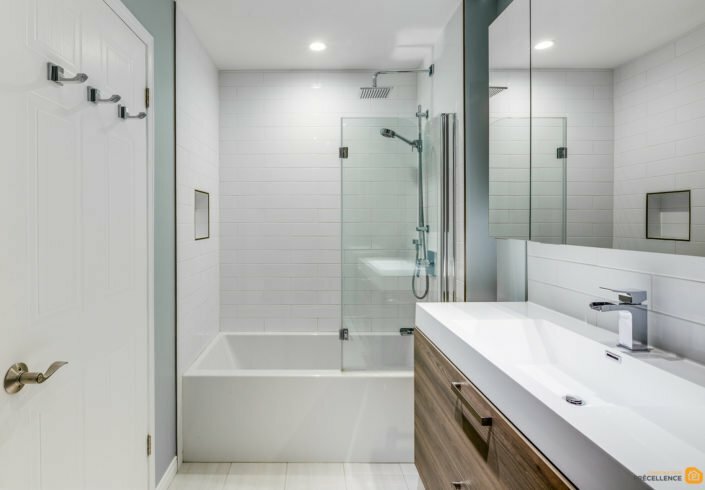 In order to maximize their space, our designer advised the clients to add a self-supporting porcelain bathtub with stainless steel faucets on the side of the bathtub. Finally, since the bathroom already has two windows, we opted for more discreet lighting: two lights above the vanity, a recessed ceiling light above the shower and two recessed ceiling lights above the bathtub. As a general contractor specialized in bathroom renovation, it is our duty to take charge of each phase of your project: design, 3D drawing, demolition, construction, renovation, post-contract monitoring, etc. To do this, Construction Précellence has established partnerships with flooring specialists, cabinet and bathroom countertop manufacturers, electricians and plasterers to make this project a success. 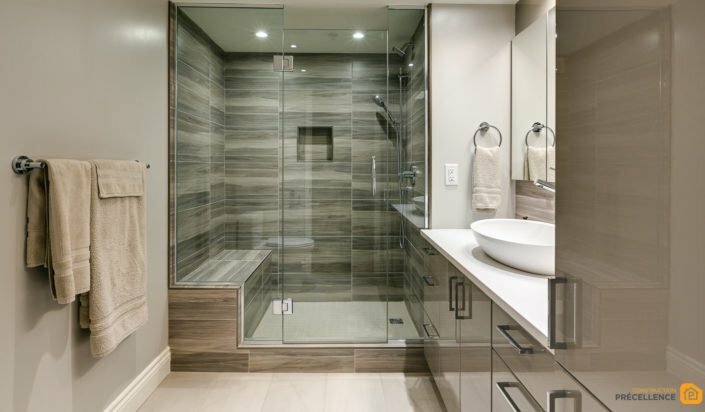 If you would like more information about the luxury bathroom renovation project on Montreal’s South Shore, about our turnkey bathroom renovation service, or about our prices, don’t hesitate to contact us by email or by phone. Your first consultation is free of charge! Our team will be pleased to welcome you and answer all your questions.